Are you the person who longs for a secluded…and we mean really secluded, cabin in the woods? Do you wonder what it would be like to be off the beaten path, where you can listen to the birds call to one another, and hear the deer snort as they forage in the woods? If you are that person who prefers nature to… well, just about everything else…then Middle of Nowhere may be the perfect hideaway for you. Backing up to Hoosier National Forest and Yellowwood State Forest, guests of Middle of Nowhere will be able to commune with Mother Nature on an up-close-and-personal level. Owned by a German grandmother, the vintage log cabin is affectionately also known as “Oma’s Cabin”, and features a number of cooking utensils, furniture, and interesting artifacts of days gone by. There’s plenty of room on the porch or outdoors to stretch your legs as you ramble around looking over the yard and surrounding woods. A screened-in gazebo and fire pit with seating invites you to linger and tell ghost stories as you gather round the campfire, making s’mores with the kids Oma might have the s’mores-making stuff in the fridge for you…so be sure to check it out. You’ll enjoy looking out into the trees from the big windows in the dining room, as you savor your breakfast and discuss the day’s activities to come. The adjoining compact kitchen has wooden counter tops and open shelving, plus the basic appliances one needs for making meals at home. Please be aware that this cabin’s water source is an underground holding tank, called a cistern, and the water is trucked in on a regular schedule. It is very important that you are conservative in your water usage! The quaint log cabin has a native stone wood-burning fireplace … imagine how nice that would be on a chilly night! A couple of futons. are available for sleeping in the living room, and a loft bedroom accessible by a steep ladder offers two twin beds and a double bed as well. While there is a window AC at Middle of Nowhere for the really hot days, there is no internet or TV service…so this is the perfect place for you to truly “unplug” and just enjoy the companionship of your family and friends. 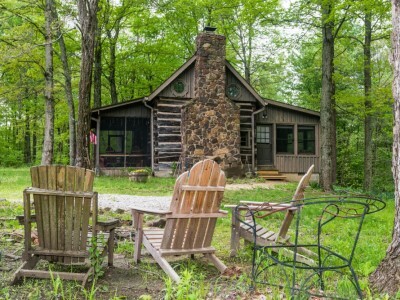 Even though this cabin is quite remote and secluded, it is a pretty oasis in the midst of government-owned forests that the true nature enthusiast will surely appreciate.